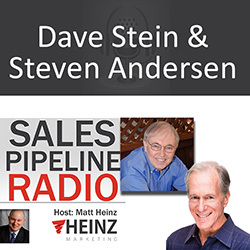 Join us as we talk to Dave Stein, co-author of BeyondTheSalesProcess.com. Sales people are focused on the immediate deal. We get that. You may win that deal, but that isn’t the way to build a long-term relationship with your customer. And we all know that acquiring the next new customer is far more expensive than growing with your exiting ones. Dave and Steven’s book has some very positive and in-depth reviews on Amazon,and it’s certainly clear readers are finding immediate takeaways. Check out their customer-focused book, which includes some top-notch companies and industry leaders from across the globe. Each one talks about a customer, and even brings their customer into their case study. The reader is taken on a journey starring real companies,real people and their real customers. Learn about their 12 strategies that illustrate the Engage/Win/Grow approach. Words like customer, trust and success seem to jump off the pages and this book doesn’t relentlessly focus on closing deals as some sales authors do. On Monday, 5/30, find the full transcript and links at Heinz Marketing.com. Live on Thurs. 5/26, Listen in at 11:30 am PT when the Queen of Social Selling, Jill Rowley joins Matt Heinz live here on Sales Pipeline Radio.